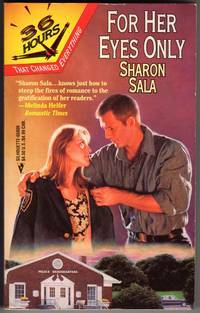 Old Tappan, New Jersey, U.S.A.: Harlequin Books, 1997. A Silhouette paperback romance, 36 HoursSeries. Condition is fine. Has very light crease on edge of front and back hinge, both hard to see, a small area of top back cover bumped, light edge wear, no stamps or writing. Pages tight and clean with light tanning, cover is bright and glossy, a nice looking book.........WRAPPED IN A PLASTIC BAG TO PROTECT CONDITION OF BOOK.....We have many other titles in this genre, and give discounts in shipping on additional books sent in the same package. please contact us for info........Summary - A senseless death shocks a community .A woman dreams of murder .A lover's life is in danger. The great disaster of Grand Springs, Colorado, had given Jessica Hanson one nasty head injury and sinister visions of murder. But no one believed she'd actually witnessed a crime, despite the fact that a body existed. Only Detective Stone Richardson paid her any attention. He had his theories, and now he had his star witness. But unlocking Jessica's secrets - and her heart - held only danger.Because now her visions foresaw another death...his.... Reprint. Soft Cover. Fine.